Monsanto (MON) and Dow AgroSciences, a unit of Dow Chemical (DOW) , could be facing a serious challenge to their crop chemical development plans. A remarkably nonrabid, diverse coalition of farmers and major food companies is pursuing legal action aimed at forcing the EPA and USDA to analyze potential risks associated with new weed killers in the pipeline. If they prevail, it could spell trouble for our heroes. The Save Our Crops Coalition, or SOCC, comprises 2,000 farmers and other food interests, including Ball Corp. (BLL) — maker of those canning jars and other food packaging — and Seneca Foods (SENEA) , maker of Libby’s brand foods. Its members represent both conventional and organic farming interests, and range from specialty growers to major agronomic crop producers. This isn’t your usual band of fringe groups making noise that no one hears. Someone might actually pay attention to them. The companies say that they are taking all possible steps to assure that these products are used responsibly. However, history has shown that they only have so much control over the behavior of end users. It’s hard to gauge how much of an impact this lawsuit could have. On one hand, Dow and Monsanto have plenty of other revenue streams, and this is just one product class. On the other, the companies are developing these products because hippies’ early predictions have started to come true: There is massive growth in herbicide-resistant weeds that no longer respond to the companies’ existing products — such as a little product called Roundup. If the lawsuit halts current development efforts, they are going to have to come up with something else. No one can predict the future, especially not me, but I suspect this may be the leading edge of a serious challenge to Dow’s and Monsanto’s product strategies. The Delta Farm Press summed up the situation neatly in a recent article title: “Days of Easy Weed Control Are Over.” The companies may have to go back to the drawing board on this one. I’m steering clear. 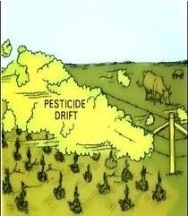 Listed below are links to blogs that reference this entry: New Herbicide Could Kill Weeds, Crops, Monsanto. This page contains a single entry by Toni published on April 23, 2012 10:57 AM. New study links autism to high-fructose corn syrup was the previous entry in this blog. How Psychiatric Drugs Made America Mad is the next entry in this blog.